You can live for a few days in the hilly greenery just 2.5km from the blue / green sea with silver sand bottom or rocks that stretch from the sea that allow you to dive, it is the joy of many who choose to come to the sea. And our apartment adds that beauty to you as well as the opportunity to live free to choose different types of life. Relax on a comfortable armchair in the shade of the large porch or under the sun diving into a sea that many envy us. The apartment is located in a hilly area 2.5 Km from the beaches of Imperia Oneglia and Imperia Porto Maurizio. Immersed in the olive trees, in a quiet and green area, the apartment is located in a two-family villa occupied on the first floor by the owner Sign. Pina will welcome you on your arrival. The apartment is located downstairs with a beautiful view of the hills of Imperia. 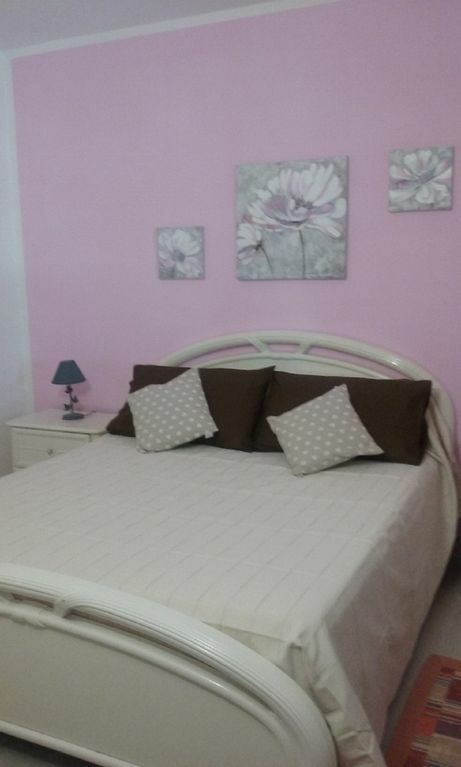 It is a large furnished apartment with a beautiful porch of 20 sqm furnished to be able to eat and sunbathe. The whole apartment is 85 square meters, can accommodate up to 4/6 people and is divided into: n. 1 double bedroom, n. 1 bedroom with 2 beds, open kitchen in the dining area and in the living room. In the living room there is a double sofa bed. IMPORTANT: APARTMENT IS ADVANCED TO PERSONS WITH HANDICAP. Small children under the age of 3 can use a cot bed to add in the master bedroom. We offer a laundry service during your stay at a charge. -Vele d'Epoca, an international biennial rally of vintage sailing boats. -Motoryacht of the Epoch, a two-year international vintage motor yacht rally which was held for the last time in September 2010. - The Book's Office, shows the market for the streets of the center of Porto Maurizio. It is the beginning of June and is held annually. -Festival Grock, is held annually in memory of the famous Swiss clown. -Oliolive, annual exhibition of oil and Ligurian gourmet products. Spring Festival, since 1997 series of initiatives for the whole Riviera of Flowers, in the period January - May. -Not White, known as Bollicine Night around August 23rd. - Whalewatch in Imperia and Sanremo is carried out every year from April to October with the CORSARA motorboat, the first and only boat in Italy specially designed and built for whale watching in the sea by the pioneer of cetacean sighting, Commander Albert Sturlese. Our sea is very beautiful and apart from the beaches on the beach, the Oneglia area and across the coast of Ponente, there are free beaches with small stones and a gorgeous open sea. The holiday we offer is a relaxing holiday, in the silence between the olive trees. In the area you will find the beaches of Porto Maurizio with a beautiful crystal-clear beach, and the rocks and small rocks of the Oneglia area. The city of Sanremo is 25 km away. At 35 the town of Menton very beautiful with beaches of pebbles and open sea. At 50 km Monte Carlo the state with the Principality of Ranieiri. The whole coastline of Liguria di Ponente and the Costa Azzurra is waiting for you to give you unforgettable days. The hinterland is also full of beautiful small villages full of history with characteristic corners and restaurants where you can enjoy the typical Ligure cuisine. For those who love to do CANYONING, in the Pornassio area 50 km from Imperia you can find a beautiful aquatic forage immersed in a wild environment, with slides even in the summer months. Three beautiful stretches where you can take some jumps and toboggan. It is characterized by three beautiful unobtrusive zones alternating with as much more open, sufficiently deep mufflers where it is possible to dive (9 m) and vertical toboggan (8 m). After the first informal area you meet a C14 where the bend is slightly exposed, it is advisable to reach it by mounting a hoist on the special arm (the rock is very slippery).